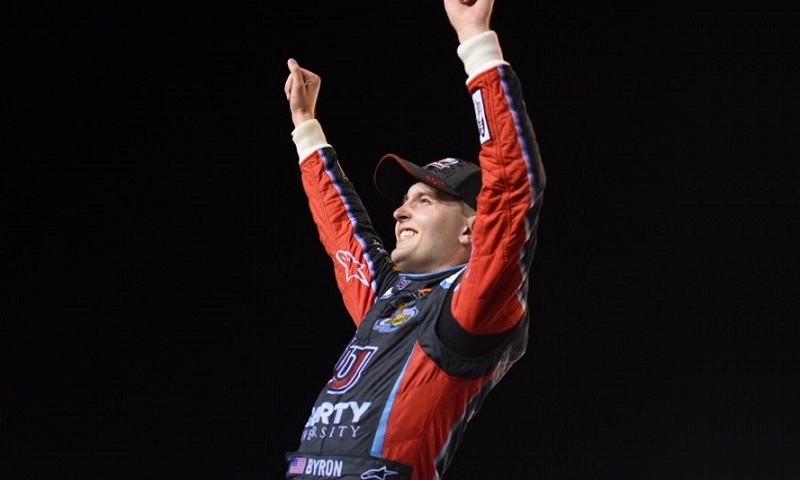 HOMESTEAD, Fla. — After enduring heartbreak in the NASCAR Camping World Truck Series playoffs last season, William Byron wasn’t going to be denied a championship again at Homestead-Miami Speedway. And after a torrid late-race battle with JR Motorsports teammate Elliott Sadler, Byron asserted himself in the closing stages and came out on top to win the NASCAR XFINITY Series title on Saturday night. Byron led the points race for much of the last two-thirds of the event, but after the final round of green-flag pit stops, his No. 9 Liberty University Chevrolet began to fall off while Sadler’s No. 1 OneMain Financial Chevrolet rose rapidly. With 38 to go, Sadler made his first bid for the title when he tried to slide past Byron and banged doors with the teenager, but the veteran kept his foot in it and completed the pass two laps later to take fourth on-track and the provisional points lead. At that point, Byron went into his playbook and moved up to the extreme high line in an effort to track Sadler back down. He closed back down to roughly three car lengths before getting into the outside wall in turn three with 22 to go, losing a full second to Sadler and appearing to have lost his chance to contend. But Byron refused to give in. He returned to the high groove and dug deep, closing on Sadler’s back bumper with 10 to go and charging to the bottom of turn three in an effort to slide past and reclaim the championship. The pass stuck and Byron motored through to third in the running order, while Sadler slid into the outside wall and faded out of the title picture with damage to the right side of his machine. From there, Byron hung on to become the second-youngest titlist in XFINITY Series history at 19 years, 11 months and 20 days old. He also becomes the second rookie champion in series history, following on from former JR Motorsports driver and soon-to-be Hendrick Motorsports teammate Chase Elliott, who took the crown in 2014 as an 18-year-old rookie. Byron’s season saw him taste success at some of the most recognizable venues in the sport, including wins Daytona Int’l Speedway and Indianapolis Motor Speedway in July, as well as his first-career win at Iowa Speedway in June and a win at Phoenix Raceway during the heart of the playoffs that secured his place among the Championship 4.